Mazatlan, Mexico - Your destination for retirement, recreation and real estate investment . Visit Mazatlanlifestyle.net and you will be one step closer to discovering and experiencing Mazatlan's friendly and affordable lifestyle. Our goal is introduce you to Mazatlan and inform you about all that the port has to offer as a recreational, retirement and investment destination. Mazatlan is an inspiring place that promises to amaze. Its privileged location on the Pacific Ocean offers endless activities such as golf, fishing, tennis, among many other activities. Its history has created a rich culture rarely seen in popular resort towns. Whether you are motivated by sports, cultural activities or simply lying on the beach, Mazatlan has something for everybody. 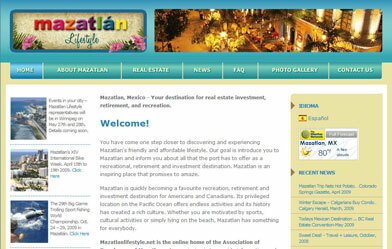 Visit our website and learn about Mazatlan, cost of living, things to do, upcoming festivals, and real estate.